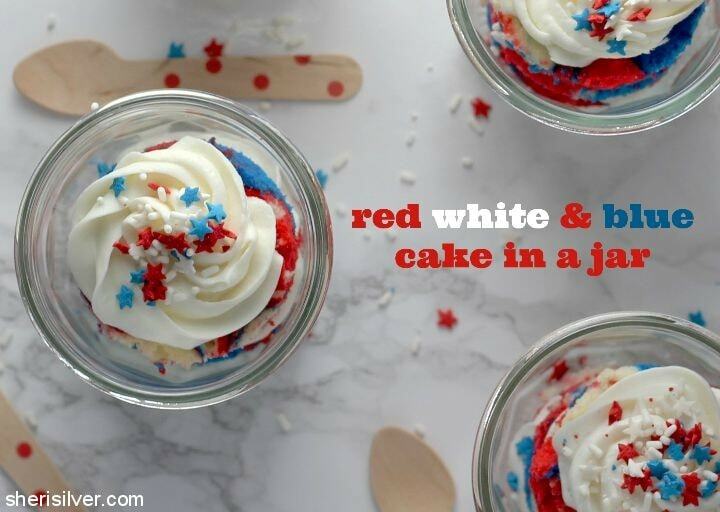 red, white and blue cake in a jar! And these couldn’t be easier. 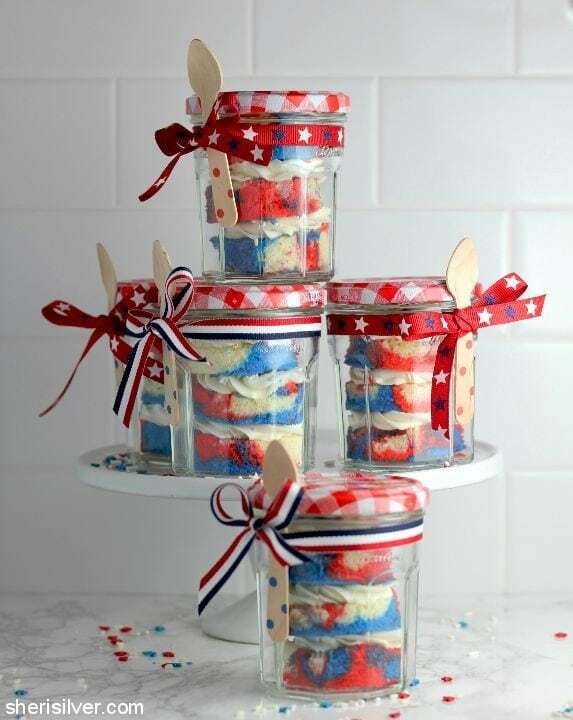 Ever since I made THESE cakes in jars I’ve been itching to make them again. And what could be more perfect for your holiday celebration than these individual cakes? For the sake of this post I used what I had on-hand – namely my fave preserves jars. So the recipe below reflects the size and number of layers I got based on the jar’s dimensions. You’ll need to adjust based on the size of your jars, but use my recipe as a guideline! Have a happy and safe holiday weekend! Pre-heat oven to 350 degrees – grease a cookie sheet (about 13″ x 18″) and line with parchment paper. 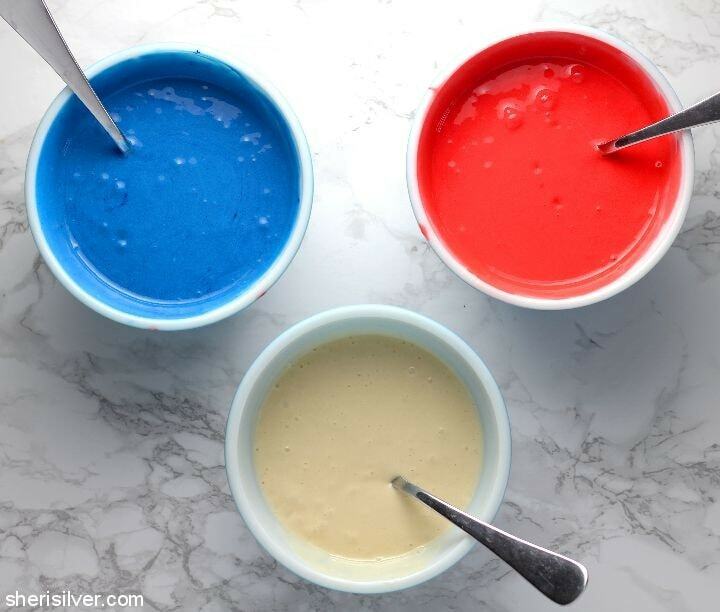 Divide the cake batter evenly between 3 bowls. Tint one of the bowls of batter red, another blue. 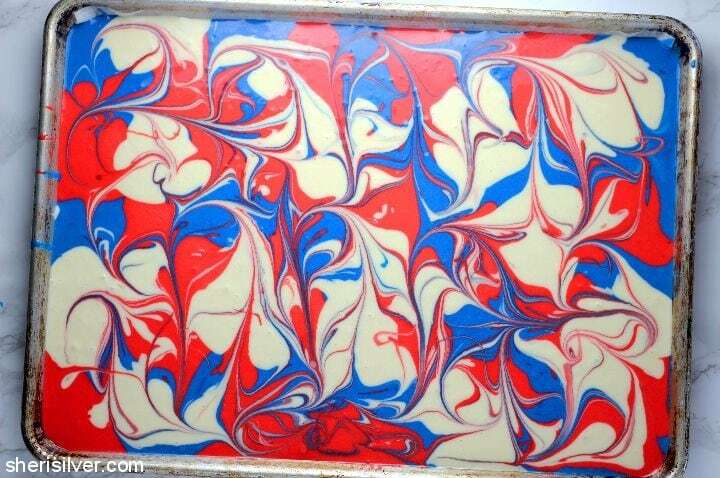 Dollop the batter in spoonfuls onto your baking sheet; use a knife to lightly swirl the colors. Bake for 10 minutes or till a toothpick tests clean. Cool the cake in the pan on a rack for 10 minutes, then carefully slide the cake onto the rack (using your parchment paper to assist) to cool completely. 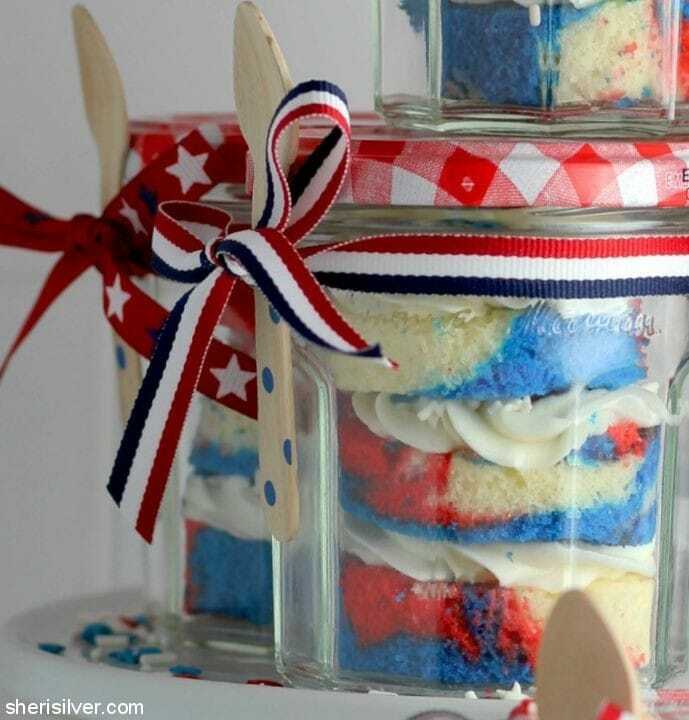 Cut the cake into circles, using a cutter that fits into the jars you will be using. I got 24 circles out of mine, using a 2 1/4″ cutter. Transfer the frosting into a piping bag fitted with a fluted tip (you can use a plain tip if you prefer, or even a heavy-duty ziploc bag with the corner snipped off). Working with one jar at a time, place one circle in the bottom. Pipe a layer of frosting on top, followed by some sprinkles. Repeat 2 more times. Cover the jars and attach a spoon to each. Store in the fridge for up to a week; bring to room temperature to serve. LOVE these! So pretty and fun!! This is so fun – pinned!! 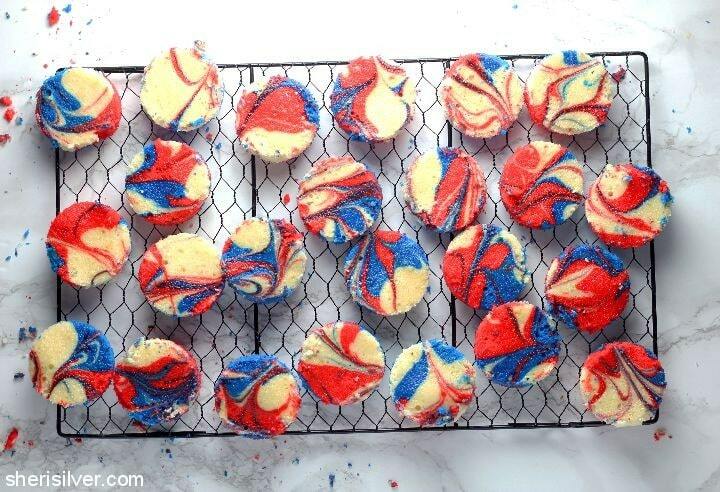 I’m making these for the 4th of July! I host a recipe blog hop – What’s For Dinner? and would be honored if you shared this recipe there. It looks delicious! 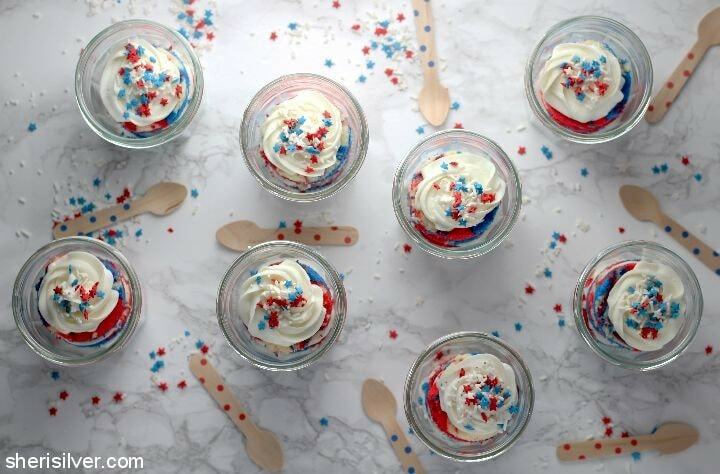 Thanks Sheri – and these treats are featured this week! Thanks for joining our party. Have a fabulous week!